Qatar Airways does a great job of setting you up for excitement. The business and first class check in facilities at Doha’s Hamad International Airport are like Ritz Carlton meets airport, and ends up becoming best friends forever. Business class boarding passes are printed on separate ticket stock, which let you know from the get go that this business really means business. 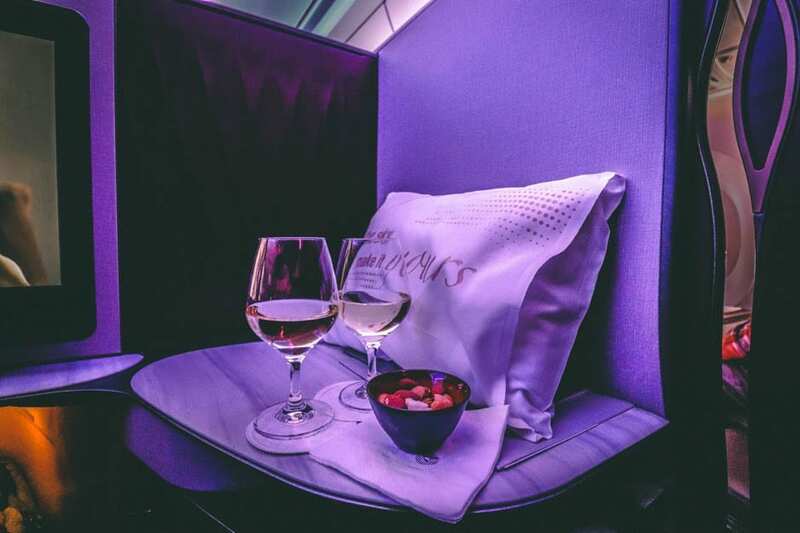 All Qatar Airways business class passengers will eventually find themselves in the Al Mourjan business class lounge, and to be sure – they’ll be very glad they did. The lounge is a multi story adventure in booze, biryani and beautiful architecture sure to delight. It can get crowded around midnight but there’s always a place to tuck in and relax. Hot tip: get to the private sleeping rooms early. It’s just beautiful inside and out, and that’s the first point. There’s an “in” and there’s an out too. The privacy doors which make the Qsuite an actual “suite” are exactly what you’d hope they’d be and can completely block out the outside world, or at least the rest of the business cabin. There’s even a DND button in the suite, for “do not disturb”. Does a do not disturb button on a plane ever get one? Is that even a question? As you settle into the suite, you can’t help but marvel at what’s really been accomplished here. Usable table space is equally, if not more substantial than all other highly lauded business seats. The entertainment screen is technically speaking, massive, even on a first class level. The foot cubby is on par with previous seats aboard the A350 and A380. When it comes to power, both USB and traditional power options are plentiful and the port is even backlit, which makes it easy to find amidst the moody lighting. Basically, the new suite has sacrificed nothing. That’s a lot to digest, and it really goes down well. Oh, and the wine does too, but you can read about that here. And let’s not forget here that thanks to the A350’s off the hook mood lighting, the thing looks like a freaking space ship. For the record, you’re totally excused if you feel like sliding your door open and shut a few times, just because you can. Rock on, young Jedi. But once the novelty has worn off enough to enjoy many a glass of champagne, it’s time to plot your entertainment. I never thought I’d say it, but the real eye opener of the QSuites experience was the lightning fast entertainment system. I simply could not believe how fast, responsive and intuitive it was. This was the first time I’ve been on an airline where I felt their big screen was both faster to load and easier to use than my iPad. It’s magnificent. Can you do the thing with the bed? Airlines love to throw out the double bed buzzword, but when you sort through it all, few actually go all the way. Sure, they may be closer together and all, but not to the point where you could sleep sideways across or something maverick like that if you wanted to. With Qatar, you totally can. They even put padding down to smooth out the entire surface. You know you’re in a double bed row if you land seats E, F respectively. All other seat letters will be further apart, including D, G for the other middle section options. What makes the setup so special is that the doors make you feel at home. I’m not advocating hanky panky, I’m just saying that you feel as if you really can have a conversation, or at the very least – feel as if you’re not on an airplane surrounded by strangers hurdling through the skies. A mind at ease makes for restful sleep, and you just can’t ask for more. Well, you can… but good luck with that. All this talk culminates into an emotional feeling. 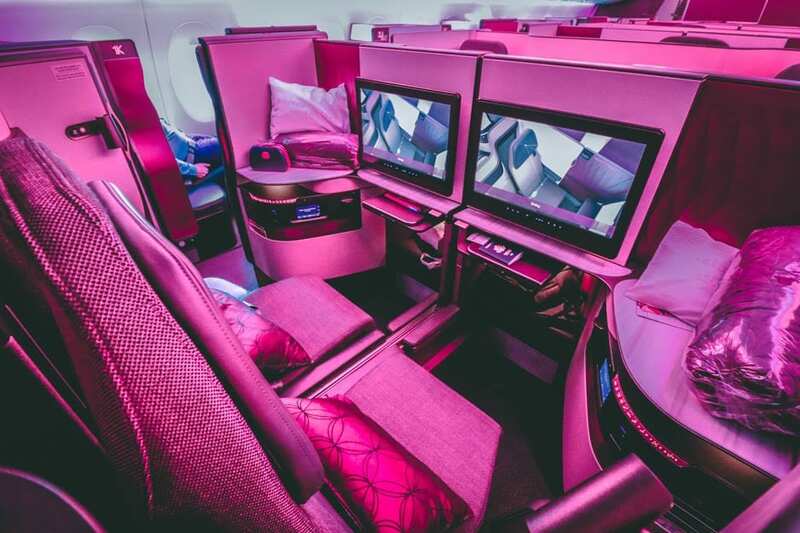 When people complain about business class, I usually tell them to a) shut up and be grateful or b) just fly first class if their snobriety cannot be tamed. After this experience, I can safely recommend a third option: fly QSuites. They really do live up to the lofty “first in business” moniker. That’s not easy, either. Is Qsuites on your bucket list? Nicely written review. Plus, the photos are great! Thank you for sharing this. Carolina at GSE Solutions.